While the Indian consumers have aspired to own international fashion brands, India’s large population base in turn has been an aspirational market for the international companies. To remote observers, the Indian market may appear to be a virgin territory as far as international apparel and footwear brands are concerned. But India has seen the presence of international brands for almost a century, including mass brands such as Bata and luxury brands such as Louis Vuitton. However, as the colonial government systematically repressed local textile production, the local resistance to foreign products grew as well. Therefore, until the 1980s, the presence of international fashion brands was negligible. In the early 1990s, as the Indian economy opened up again, a few international fashion brands entered the Indian market. The pioneering companies during this stage were Benetton, Coats Viyella and VF Corporation. At this time the Indian apparel market was still fragmented, with multiple local and regional labels and very few national brands. Ready-to-wear apparel was prevalent primarily for the menswear segment which was thus a target for many international fashion brands (such as Louis Philippe, Arrow, Allen Solly, Lacoste, Adidas and Nike). In the midst of this the media industry was also witnessing a high growth which aided the international brands in gaining visibility and establishing brand equity in the Indian market. The late-1990s marked a significant milestone in the growth of modern retail in India. Higher disposable incomes and the availability of credit significantly enhanced the consumers’ buying power. A growing supply of good-quality retail real estate in the form of shopping centers and large format department stores also allowed companies to create a more complete brand experience through exclusive brand stores and shops-in-shop. The number of international brands continued to grow each year at a steady pace until the early 2000s, and took off exponentially thereafter. By 2005 the number of international fashion brands present in India was over three times compared to that in the mid 1990s. The last few years (since 2005) have continued the significant growth of international fashion brands, including luxury brands such as LVMH, Aigner, Tommy Hilfiger and Chanel. Many of the international companies entering India in the late 1980s and 1990s chose licensing as the entry route to India to gain a quick access to the Indian market at a minimal investment. A few companies such as Levi Strauss set up wholly owned subsidiaries while others such as Adidas and Reebok entered into majority-owned joint ventures. This helped them to gain a greater control over their Indian operations, sourcing and supply chain, and brand. In the subsequent years import duties for fashion products successively came down making imports a less expensive sourcing option and the realty boom brought investors in retail real estate that were ideal franchisees for the international brands. By 2003, franchising became the preferred launch vehicle for an increasing number of international companies, while only a few chose to enter through licensing. In 2006 the Government of India reopened retail to foreign investment (allowing up to 51 per cent foreign direct investment in “Single Brand” retail). Using this route, many brands have entered India by setting up majority owned joint ventures, or transitioned their existing franchise arrangements into a joint venture structure. Note: The above table shows the structure used during entry, and not the structure that exists currently. By the end of 2008, just under half of the brands were present through a franchise or distribution relationship, while over a quarter had either a wholly-owned or majority-owned subsidiary. These structures allowed the brands to have greater control of operations, particularly of product. Many international companies have evolved their presence in India into structures different from those at the time they entered the market. 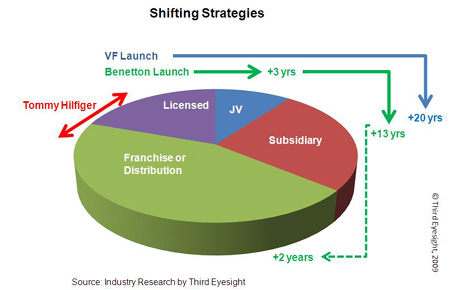 A good example depicting the shift in business strategy is that of VF Corporation which entered India in 1980s by assigning the Wrangler license to Dupont Sportswear. Since then it has launched a variety of brands in different product categories with number of Indian partners and finally formed a joint venture, VF Arvind Brands Pvt. Ltd., with Arvind Brands. Another example of a company that has evolved its presence is Benetton, which first entered India through a licensee (Dalmia). Benetton then transitioned in 1991 into 50:50 joint-venture and finally in 2004 took over the Indian business completely. However, it adopted the franchising route in 2006 for its premium fashion brand, Sisley, appointing Trent (a Tata Group company) as the national retail franchisee. 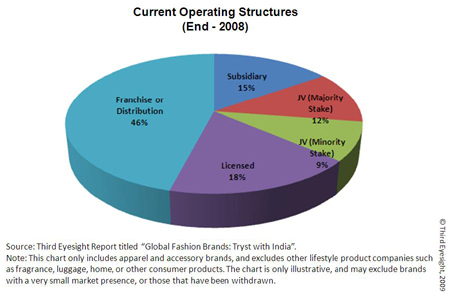 Many other companies such as Nike, Tommy Hilfiger, Marks & Spencer and Pierre Cardin (as described in our report “Global Fashion Brands: Tryst with India”) have changed their approach as the original structures did not perform as well as they had expected. Obviously, each such change has cost the brands time, management effort, money and, sometimes, market share. We believe that these shifts and the pain related to it could have been reduced, had the brands ruthlessly questioned the motivation for considering this market and their expectations from the market in determining an appropriate strategy. In the midst of economic upheaval around the world, how does India look as a market for international fashion brands? Well, it is difficult to generalize even in the best of times. In the current global turmoil there is certainly a lot more unpredictability about international expansion for most companies. Although India’s position as a target market for international brands has been improving, as is evident from the number of launches in the last 6-7 years, some companies considering international expansion may prefer entering other markets that may seem more “familiar”, developed and safe (such as Europe, Japan, South Korea or Taiwan). Against such comparisons, India’s growing but fragmented market can seem chaotic and difficult to deal with. However, the fact remains that there are very few markets globally that can provide the sustained size of mid-term and long-term opportunity that India does. We are already seeing the more far-sighted and committed brands consolidating their position and presence in the market by continuing to look at expansion, even while examining how they can make their existing points of sale perform better. We also constantly come across new companies carrying out investigations into the market. In the current environment we expect to see a shift in the nature of launch vehicle. While franchising seems to be a safe option for risk-averse brands in the current times, we will probably see more brands with a long term strategy, who would establish a controlled presence either through joint-ventures or through wholly-owned subsidiaries, since they can lay the foundation of the business today at much lower costs today than in the past few years. India’s foreign direct investment (FDI) policy, allowing FDI only up to 51% in retail trading of “Single Brand” may have held back some fashion brands as they are still managed by owner founder with a conservative outlook on “control”. However, in the last couple of years, we have found companies not being deterred by the barriers to FDI. As their comfort and familiarity with India has grown, international companies are more willing today to create corporate structures that allow them a presence in the market today and a step-through to a more controlling stake as and when government regulations allow. All in all, we feel that international brands are in India not only to stay, but also to expand. There is yet a lot of potential untapped in the market, and as the integration of the Indian consumer with global trends continues, international brands can expect to find India an increasingly fertile ground for growth. It’s really very Nice , Very much usefull and interesting article. Really interesting and useful article, it will be highliy appreciated if we can also learn the China model. Your opinion about “growing supply of good-quality retail real estate franchise India” is right. very interesting article for students like me who has less knowledge on the entry methods, status of international brands in developing nations like india. it would have been better if the way how these company adapted to the indian market is also explained.